In the Arctic few animals can live. There is one hearty bird that braves the cold conditions called the Arctic tern. The Arctic tern is a medium sized bird that looks rather normal. Yet it is an exceptional bird and not only for its ability to handle the cold climate. The Arctic tern holds the record for the farthest flying bird. As the Arctic summer wanes this tern wings its way south along the coasts of the world’s continents all the way to the oceans of Antarctica. The seasons of the Southern Hemisphere are opposite to those of the Northern. So, during the Arctic winter Antarctica experiences summer. This is why the tern makes a trip of such great length. It continually seeks the mild summer weather no matter how far it must go. The Arctic tern will literally go to the ends of the earth to stay close to the mild warmth. In this pursuit the Arctic tern flies more than the circumference of the earth each year, totaling 24,901 miles (40,075 km).1 Most terns live about 15 to 30 years. 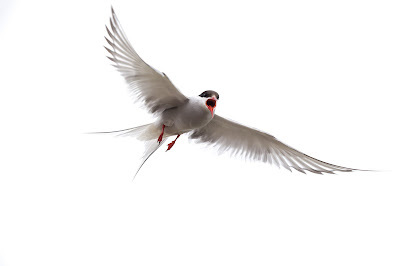 Over the course of their life an Arctic tern can fly as many as 1,000,000 miles (1,609,344 km)! The Arctic tern offers an insightful example of faithfulness. As followers of God we are called to live according to His standard. Sadly, modern Christians often act more on their feelings than on faithfulness. Many examples throughout the Bible illustrate that it is possible to live a life faithful to the precepts of God such as Abraham, Job, Joseph, and others. Jesus called his followers to obedience to the will of God, no exceptions. When Jesus forgave a person’s sins, he told them to go and sin no more. The Merriam-Webster dictionary describes faithfulness as: firm adherence to promises or observance of duty.2 Faithfulness is different from working hard. One can work hard without believing in what they are doing, especially if paid for it. But it is quite difficult to stay faithful to something you do not believe in. We cannot gain God’s favor no matter how hard we work. But the Bible tells us that God rewards faithfulness (1 Samuel 26:23a). Biblical faithfulness means continuing to believe in God’s promises even when we have doubt. It means spreading the gospel no matter what challenges are faced. And it means living righteously and without sin. Can you describe what it means to be a faithful Christian? If we stumble in sin does this mean we have been unfaithful? What is the only way we can be truly faithful to God? How far would you be willing to go to remain faithful to God? 1 Allan and Helen Cruickshank, 1001 Questions Answered About Birds. (1958). Grosset & Dunlap Publishers. New York. Print. 2 "Faithful." Merriam-Webster.com. Accessed December 26, 2017. https://www.merriam-webster.com/dictionary/faithful. All verses were taken from the World English Bible (WEB) published 2000 in the public domain.